It is oft-times said that the eyes are window to the soul. It seems to me that, especially in the case of the eyes of animals, that the eyes are the mirror of the onlooker’s soul. The falcon’s eye – bright, golden and fierce – shows the falcon’s power and that the falcon lives to fly, stoop, to strike and kill. It possesses a clarity of thought uncluttered by distractions. Man looks into the� falcon’s eye and feels a deep and abiding� respect. The raven’s eye – dark, brooding and cunning – shows the raven’s wisdom and that the raven lives by its tenacity and cunning, knowing that all that flies, walks or swims, is naught but food. Man looks into the raven’s eye and feels the cold grip of fear. Man respects the falcons ferocity and his simplicity of purpose. Man fears the cunning and the complex wisdom of the raven. This, I suppose, makes sense; it is Man’s nature to respect power if he can predict how it will be used, but to fear wisdom and cunning whose aims and means he cannot fathom. This entry was posted on Tuesday, November 10th, 2009 at 7:27 am and is filed under Musings. You can leave a response, or trackback from your own site. Just now getting familiar with your site. I of course found you from Rguys blog. Just one question, What is up with the picture? Very dark. Very Odd. Exceptionally so when compared with your ideology. Welcome aboard, Jay! I’m glad you’ve stopped in at Reflections From A Murky Pond. 😆 That’s my avatar. I get a lot of questions about it, and a lot of joking – I think – complaints that it gives people nightmares. Frankly, it suits me and I think it’s a fair representation of my self. I’m very dark and very odd. You are a bit of an enigma. Dark and odd do not usually corralate to Republican and Conservative. In general it brings to mind an anarchist. Good though. I like complexity in people. It makes them interesting. The first picture on the page http://blog.jonolan.net/musings/birds-eye-view/ is called a falcon, but it is not. 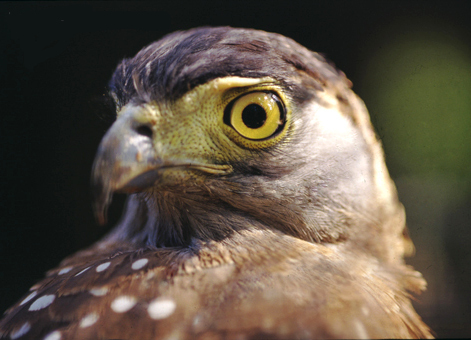 It is an eagle Spilornis holospilus, called the Philippine Serpent-Eagle. Falcons have completely dark eyes — no yellow iris showing, and a “notched” beak, not a simple curved one.